If you thought Jack Frost nips your nose in Northeast Ohio because he’s a sadist, well…you don’t know Jack. 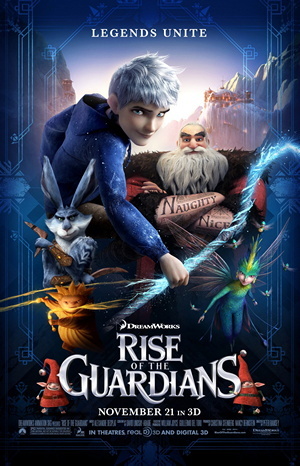 DreamWorks’s latest CG fantasy RISE OF THE GUARDIANS reimagines Jack (Chris Pine) as a mischievous teen who’s devoted his life to leisure. Our story begins with The Man in the Moon transforming the boy into a “Guardian” following an icy accident that blows him right out of his boots. Jack's hair goes from brown to white, and the walking stick he finds on a frozen pond becomes a magic scepter that turns everything it touches to snow. But the spirited youth isn’t quite sure what to do with his new abilities, or why he of all people received them. So Jack spends the next three centuries running gaily about the globe barefoot, bringing winter to the world whether people want it or not. At his best, Jack’s icy touch results in toboggan chutes and Snow Days for school kids—but he never considers his spreading cold weather a noble profession. Nor does he question why children can’t actually see or hear him; they pass right through his ephemeral body during snowball fights like he’s a ghost. Which he may well be. Jack is summoned (kidnapped, actually) by his fellow Guardians when a malevolent force threatens to undo their good works and screw things up for kids everywhere. These benevolent beings—Santa “North” Claus, Easter Bunny, Sandman, and Tooth Fairy—are essentially holiday versions of The Avengers superhero team. They’ve each got unique powers and personalities, and are equally entrusted by Mr. Moon to protect some important aspect of childhood essence. Naturally, Jack’s taken aback; he was never sure these characters were real, much less that they'd invite him to join their ranks in a battle against Evil Incarnate. North (Alec Baldwin) is a broad-shouldered ex-Cossack living in a secluded Ice Castle in the Arctic Circle. He’s bearded and jolly, alright—but he’s also got “Naughty” and “Nice” sleeve tattoos and a thick Russian accent. The workers in his toyshop consist of lumbering Yeti as well as pint-sized elves, and it’s through the perpetuation of Christmas cheer that North maintains legendary status as Guardian of Wonder. Easter Bunny (Hugh Jackman) is a buck-tooth, boomerang-toting hare with a hot temper. As Guardian of Hope, Bunny dashes down teleportation rabbit holes to deliver candy and spread the joys of springtime renewal to human youngsters. The eldest Guardian, Sandman, holds dominion over kids’ dreams. The mute, orangish imp begins his rounds at twilight, using tendrils of enchanted dust to seed little tikes’ subconscious with warm, pleasant thoughts. Sandy lets his grain do his talking; images form above his head during conversations like castles on a beach. And if these manifestations aren’t “loud” enough, he resorts to a pair of whips that concentrate his energy (a la Ivan Vanko in IRON MAN 2) into physical shapes so huge they can’t be ignored (like the brachiosaurs in JURASSIC PARK). The Tooth Fairy (Isla Fisher) is a half-hummingbird fairy whose tiny, winged assistants gather lost incisors and bicuspids from under kids’ pillows and stores them in gilded jewelry boxes in the sky. She is the Guardian of Memories, and it turns out children’s choppers are the keys for unlocking their youthful visions. Jack’s no exception; he must find his own confiscated teeth and relive tragedy in order to realize his purpose—or “center” as a Guardian. Our villain is Pitch Black (Jude Law)—of legendary “Boogeyman” lore—whose plot is to engulf the world in darkness because…well, just because he’s been ignored for too darn long. He is Darth Vader to Sandman’s Yoda when it comes to manipulating the stuff of dreams, imbuing the psyches of slumbering youngsters with fear and sorrow in place of imagination and happiness. Pitch has a lot in common with Jack (slicked hair and snaggletooth sneer notwithstanding). They’re loners, and children don’t invest much stock in either of them the way they do Santa, Tooth, and Bunny—the special occasion icons who leave presents when they visit. And if kids stop believing in a Guardian, his lunar-derived dazzle fades until he ceases to exist. It doesn’t matter whether kids hate Pitch so long as they’re convinced The Boogeyman still exists, but it’d help not having the do-gooder Guardians around siphoning all the attention. So Pitch schemes to wipeout rival Sandman, sabotage the seasons for Santa and Bunny, and unleash his nightmarish black stallions on the world. And if Pitch can’t defeat spritely newcomer Jack, maybe he can lure the lad to the Dark Side…. Based on Thomas Joyce’s book series The Guardians of Childhood and The Man in the Moon, GUARDIANS turns familiar mythical figures into peppy, playful action heroes worthy a toy manufacturer’s attention. Santa’s sleigh is given a hotrod makeover. Bunny zigs with ninja stealth and zags with commando quickness. Tooth Fairy brings female sensibility to the conflict and connects with Jack in a way the others don’t. And Frost himself displays a childlike vulnerability in spite of his impetuousness—but both traits will endear him to young audiences. One of the more memorable sequences has the Guardians making a contest out of collecting teeth for Fairy after Pitch cages her diminutive helpers. Several effective gags result when the heroes use their respective powers (dropping down chimneys, hopping out of rabbit holes, etc.) to ambush and one-up each other. Later, the group helps Bunny on Easter morning, and even Santa’s Yeti are put to work painting eggs instead of toys. Peter Ramsey acquits himself marvelously in his first major directorial outing. RISE is engaging, colorful, and—at times—touching. French composer Alexandre Desplat (ARGO, TREE OF LIFE, etc.) lends an appropriately busy, boisterous score that’ll rivet kids to screens in theatres and at home, where this cacophonous cartoon is likely to receive repeated DVD spins around Christmas. 2 1/2 out of 4 stars.